It's early springtime on the ranch, and Hank is going through the usual motions of making sure that a warm spring arrives safely: singing songs about it, barking faithfully each morning, and helping the cowboys with their work around the ranch. However, in the midst of a particularly hard day’s nap, he receives a report that his little birdy friend, Madame Moonshine, is in danger of being eaten by Pete the Barncat! 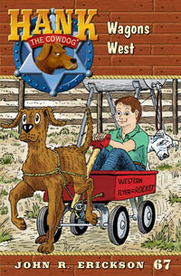 Naturally, Hank springs into action to save her, but a misstep brings the wrath of Sally May down on his head, and Hank must flee the scene of the rescue and travel west on the Oregon Trail with Little Alfred. Later, when a freak storm causes the creek to rise, stranding Little Alfred far from the house, Hank must rely on his instincts and clever wits—and perhaps a little help from Madame Moonshine—to keep them both safe and get Alfred back to his mother! ...Maybe you guessed what Drover did, because it was entirely predictable, entirely in keeping with his miserable record with the Security Division. But somehow it caught me by surprise. After convincing his commanding officer that he was ready to dive over the fence and rush into combat, he dashed two steps forward, swerved left, cut a half-circle on the gravel drive, and went sprinting straight toward the machine shed. Do you see what he was doing? He was quoting me against myself, the very lowest form of treachery. I should have known that he would take the weenie’s way out, but I had dared to hope, dared to believe that this time might be different. It wasn’t. He scampered up the hill, dived through the slot between the big sliding doors, and vanished inside, leaving me stunned and crushed with disappointment. For a moment of heart beats, I thought about marching up the hill and jerking him out of the machine shed by his ear, but that would have taken time, and time was something we didn’t have. Don’t forget the tragic scene that was taking shape inside the yard. A friend of mine was about to be devoured by the local cat. I whirled around and rushed to the yard gate, and here’s what I saw. Poor Madame Moonshine had knocked herself unconscious on the window glass and lay potsrate in the flower bed. Pete stood over her, licking his chops and beaming an evil smile. I had to do something, and fast. He ignored me, of course, and I had to stand there and watch. Have you ever seen a cat that has just captured a bird? They go through the same silly routine, every time. He picked up the bird in his mouth, turned his back on me, pinned down his ears, flicked the last two inches of his tail back and forth, and…this was the part that really got my goatee…he unleashed an eerie sound from somewhere deep in his cheating little throat. It started in the high range of yowling, a cheap imitation of a police siren, and worked its way down to the low range, a cheap imitation of growling. Obviously he was yowling and growling at ME, since I was the only one around, and maybe he thought…what? That it would scare me so badly, I would run away and hide under my bed? Ha. You know, cats have a primitive form of intelligence, about the level of a tapeworm. They’re experts at lying, cheating, stealing, and spreading chaos, but they don’t understand dogs at all. Hey, if you want to get a dog pumped up and ready for war, all you have to do is find some misguided little ranch cat to yowl and growl. That’ll do it. Every time. I mean, it comes like a surge of electricity. It’s as though we’re hearing a hundred-piece band, playing a stirring march by John Phillip Salsa. Ten thousand kilowhoops of electricity shot down my backbone. My ears leaped up and in my deepest heart, I sensed that I was about to surrender myself to the savage delight of being a dog—a dog on a righteous mission. I hit engines one and two, and went flying over the…actually, I aimed a little low on the first try and rammed the fence. No big deal. In moments of high passion, we often get faulty readings on our instruments and misjudge…but the imported poink is that on the second attempt, I cleared that fence like a deer, hit the ground, and came up loaded for bear. Any creature with half a brain would have dropped the bird and run for his life, screaming and terrified, but not old Pete. Oh no. Instead, he held onto the bird, turned up the volume of his yowling, and began edging backward, totally unaware that this was the equivalent of tossing gasoline into a roaring fire. Then, in a flash, he turned and ran, still yowling and still carrying the bird in his cheating, scheming little mouth. He hopped through the iris patch and dashed around the northwest corner of the house.